Tyler Cowen writes Are volunteers better fighters? 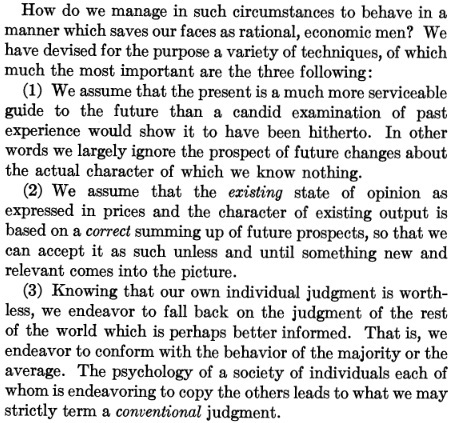 Too often discussions of the relationship between Keynes’ General Theory and the ISLM model focus on John Hicks’ 1937 paper ‘Mr. Keynes and the Classics‘. That paper appeared in the April edition of Econometrica, Volume 5, Issue 2. But Roy Harrod had already formulated the ISLM — in half-mathematical, half-verbal form — in the January edition of the same journal, Volume 5, Issue 1. I think that an appraisal of the relationship between the General Theory and the ISLM is far better done taking leave from Harrod’s paper ‘Mr. Keynes and Traditional Theory’ as it will allow us to clearly highlight the differences and why Harrod glossed over them. Of course, this is not in fact the case. Rather for Keynes investment is determined by the interest rate and the marginal efficiency of capital. The difference in the two concepts is absolutely key to understanding Keynesian economics proper. The marginal productivity of capital is a simple concept: it is the amount of output that is produced by an additional increment of capital. The standard theory says that investors will invest up to the point that the marginal productivity of capital is equal to the rate of interest. This makes sense on its own terms (that is, assuming perfectly rational, competitive etc. actors). If the rate of interest is, say, 2% and invested capital is throwing off profits of 3%, rational investors will step in and borrow at 2% to obtain the profits. Eventually the ‘spread’ between the two rates will become equalised. The reader will appreciate the enormous difference here. 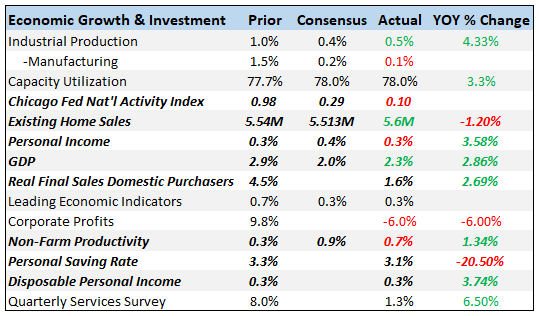 Investment becomes wholly subject to expectations — what Keynes will elsewhere call ‘animal spirits’. He thinks that if this is not taken into account the theory of investment “imports into it a large element of unreality” and will thus, presumably, not be commensurate with the real world. Harrod actually recognises this while he is expounding the ISLM view of Keynes’ work. But he then glosses over it. Harrod seems to recognise to some extent the difference here and praises Keynes’ incorporation of expectations. But he then moves to gloss over this difference. In order to do this he introduces an interesting trope: that of the ‘working economist’. The ‘working economist’ appears to be, for Harrod, the dupe or the idiot who cannot properly understand the nuances of high theory and needs some simplistic explanation such as the ISLM. This seems a rather strange maneuver on Harrod’s part. It is clear that there are a lot of ‘working economists’ who do appear to require such constructions in that they insist on closed, deterministic models. But I would argue that they are just bad economists. I do not see why it is so problematic to tell students (or whoever) quite clearly that investment is determined through expectational formation. Those students who cannot get their heads around this and insist that they must ‘close’ the model and make investment ‘determined’ by the marginal productivity can simply pack up and take their bags elsewhere. If you can’t deal with this aspect you will not be good at applying economic theory to the real world and your pronouncements on the economy will be suspect. End of story. Harrod had been working on his ‘dynamic economics’ the whole time that Keynes had been working on his General Theory. There was thus a certain amount of rivalry between the two. So, Harrod thinks that expectations should only be brought in when dynamics are being discussed. But this is just a miscommunication between the two men. 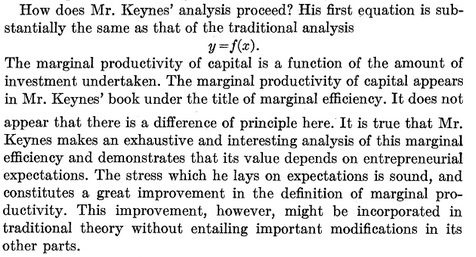 Keynes is clearly interested in dynamics. That is why he writes that determining the rate of investment by equating the marginal productivity of capital and the rate of interest “has had the result of breaking the theoretical link between to-day and to-morrow”. What Harrod will try to develop in the ensuing years will be perfectly in keeping with what Keynes was doing. But Harrod felt the need to distinguish his work from Keynes’. That is why he suppressed the dynamic element in Keynes’ General Theory: so that he could claim that he was the first to introduce this aspect of economics. This is a narcissism of small differences if ever you may come across one. Today, however, the men Harrod rather derogatorily called ‘working economists’ have won the day. Students are simply not taught the real-world truth: investment is determined by expectations about the future that are not subject to mathematical formalisation or reduction. 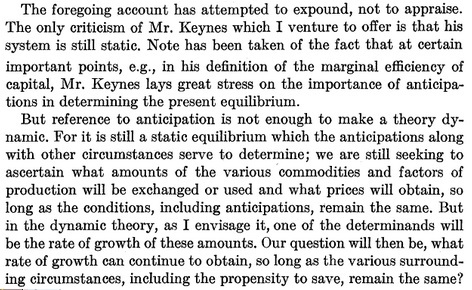 One month after Harrod’s review appeared Keynes published a summary of his work in which he noted the danger inherent in the interpretation that Harrod was putting forward. 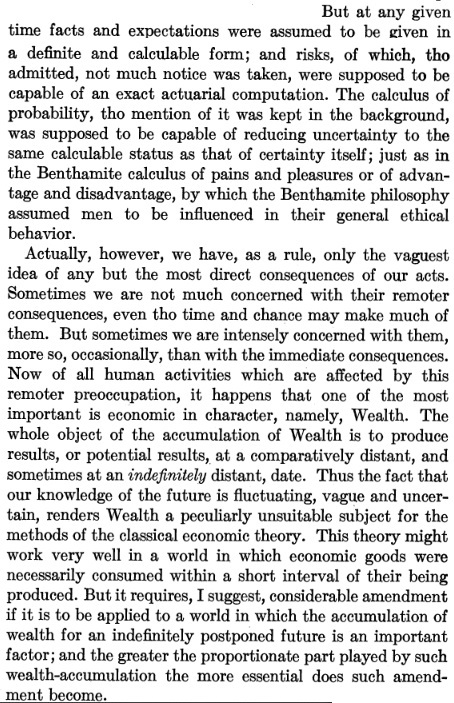 Keynes clearly saw the modern development that Harrod’s ‘working economists’ would begin to use probability theorems to determine investment decisions. He saw that this was already somewhat implicit in the theory yet never expressed. But he also knew that this would only produce unrealistic rubbish. Basically, people pretend ‘as if’ they know what is going on. But they do not and cannot. Keynes opened the way for work to be done on how people actually cope when faced with an uncertain future. GLS Shackle paved the way for work to be done in this area but it went largely ignored (except by a few obscure psychologists). Today, however, this black box has been opened once more by a team of researchers at University College London. Using a mixture of empirical techniques, psychoanalytical theory and economic analysis these researchers have opened up a box that has been sealed for a very long time indeed. Their findings so far, some of which I believe are being taken quite seriously by the Bank of England, are extremely promising. Frankly, I think they might change the way that good economics is done. The ‘working economists’, however, will probably not be very happy about this at all. Would You Pay $50,000 So Your Baby Can Be Born In The USA?